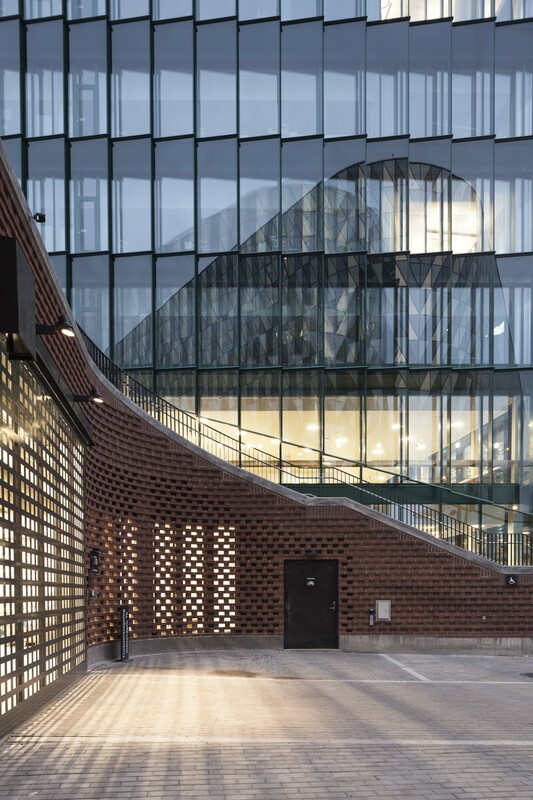 The winner of the Årets Bygge 2019, an annual prize for the best Swedish public building of the year, is Biomedicum, the new research centre of the Karolinska Institute, Stockholm, completed in summer 2018 and designed by the C.F. Møller Architects studio. Biomedicum, which opened in summer 2018 and was designed by the C.F. 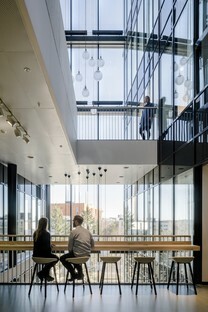 Møller Architects, studio, is the research centre of theKarolinska Institute in Stockholm, the famous Swedish university that is one of the most important in the field of medicine worldwide. Every year a committee of experts from the institute selects the winners of Nobel Prize in medicine and physiology. Itâ's therefore easy to see the huge importance of the research centre, which is the real driving force behind the institute, and its design and completion were eagerly awaited. In the past, the Karolinska Instituteâ's red brick research laboratories, built in the 1930s, were spread around the campus. The design byC.F. Møller Architects had an important primary aim: that of combining all the laboratories, offices and research centre spaces in a single structure. 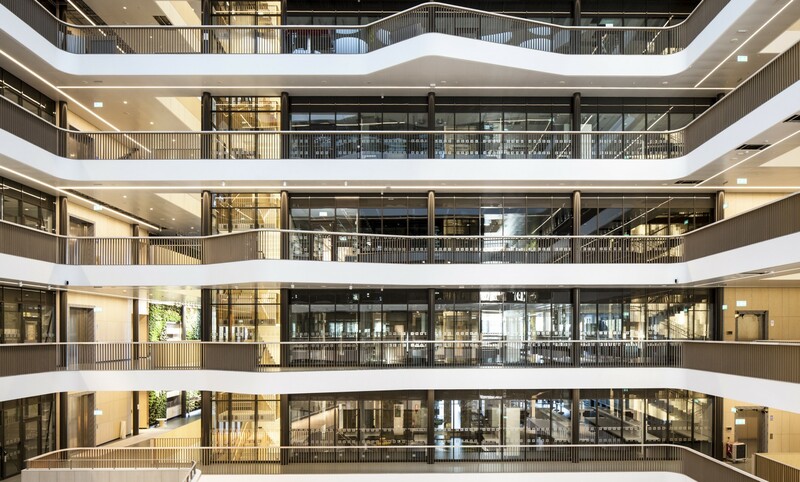 The new building meets the need for modern, flexible spaces that promote seamless collaboration between the various research and study environments. The building is home to around 1600 researchers and staff, an important number, as modern research requires complex environments, able to house multiple groups of users who need dynamic, stimulating spaces. These are sustainable constructions that become a point of attraction for its context and for local citizens. The centre has four buildings gathered around a full height atrium, with large skylights to let in the sunlight and facades entirely in glass. The conceptual outline of C.F. Møller Architects sums up an important step: not only a single construction but, above all, from “buildings in a park” it has become “a park in a building”. The campus park permeates the new research centre. The large green atrium, which is the heart of the building, becomes the ideal continuation of the campus park. This gives Biomedicum a space that reinforces interdisciplinarity, meeting and knowledge-sharing in an informal, relaxed environment. This sharing also extends onto the campus and promotes links with the instituteâ's other structures, with the city and with the new Nya Karolinska Solna (NKS) university hospital, which will be adjacent to the centre. All this is possible thanks to its transparent ground floor, where as well as the entrance to the atrium, there is a public exhibition space, an auditorium, conference rooms and a café. 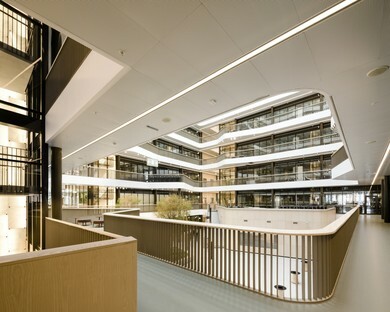 This design feature makes Biomedicum an important landmark for the whole area, linked directly by a glass walkway to the BioClinicum, the Karolinska University Hospital research centre. The new centre has already won important awards. In late March 2019, it was awarded the Årets Bygge 2019. 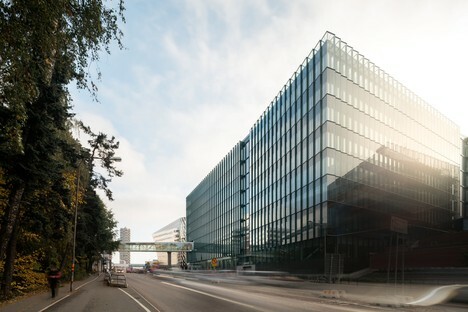 The prize is given each year to the best public building in Sweden and is chosen by a jury of experts from 20 candidate designs for that year. Each building is evaluated on five main criteria: partnership, technology/innovation, time/quality/budget, sustainability and safety.